As the holidays are upon us now is a good time to consider the effects of drinking and driving and how you can avoid an arrest or causing an accident. My experience comes from 15 years of legal representation. Even though the legal limit in California and many other states is a 0.08 blood-alcohol level most forensic toxicologist (folks who study the effect of alcohol on the body) will say that alcohol really starts to effect people at the 0.05 blood-alcohol level. Almost half of the legal limit! Under California Law even if you are under the 0.08 level you can still be prosecuted for driving under the influence if it can be shown that alcohol in your system impaired your driving. Some people can suffer physical impairment from alcohol at levels lower then other people. While it is important to know your limits it is much more important to count the number of drinks you have ingested over a particular time frame so nothing is left to chance. What follows is a general guide for deciding based on your weight, number of drinks and amount of time, whether you should drive. 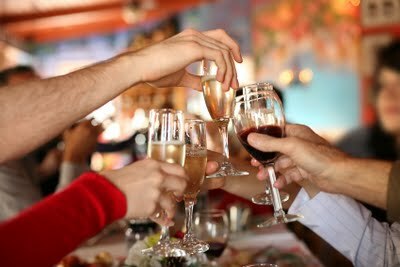 First we have to start with ground rules: (1) a 12 ounce beer, a shot (normal size) and a 4 ounce glass of wine all have the same amount of alcohol and will effect you almost entirely the same; (2) every hour your body will burn off the equivalent of the alcohol in a 12 ounce beer, a shot or a 4 ounce glass of wine through the natural metabolism process of the body. That is, your body will naturally eliminate one of each of those amounts of alcohol about every hour. We get drunk when we drink in excess of what our body can eliminate in a given time frame. The best way to illustrate how much we can drink is to use examples. Remember, these are approximations but they give a pretty good idea of when you may be intoxicated for driving. (1) First subject: 110 lbs person (man or woman does not matter) drinks 2 twelve ounce beer starting at 7:00 p.m. and finish drinking both beers at 7:45 p.m. What is the person's blood alcohol level at 8:00 p.m.? If you weigh around 110 lbs every alcoholic beverage you ingest will peak at a blood alcohol level of about 0.03 when the beverage is fully absorbed and before elimination. So by 8:00 p.m. that first beer will have been fully absorbed and eliminated from the body, which will leave one beer still in the system and thus the person will have a blood alcohol level of about 0.03. (2) Second subject: 190 lbs. person drinks 3 twelve ounce beers and 3 shots of tequila (6 drinks total) starting at 7:00 pm and finishing the last drink of alcohol at 7:45 p.m. What is the person's blood alcohol level at 8:00 pm? If you weigh 190 lbs one twelve ounce beer or shot will raise your blood alcohol about 0.02. So by 8:00 p.m. one of the drinks will have been eliminated which means there are still five drinks in the system which means the individual's blood alcohol level will be approximately .08-.10. This level is over the limit of course and many forensic toxicologists will say that driving may be impaired at 0.05. or about half that amount. The elimination of alcohol varies from person to person so the rate for one person may differ slightly from another. Also, if you are unsure of how many drinks you have then waiting an hour before driving will eliminate one drink. Be safe out there! The subject of Blood Alcohol Concentration is indeed a very complex one and the calculation of BAC, even when simplified as you have above, is not something that can be managed by the average social drinker while they participate in the act of drinking. Cognitive ability is the first thing to become affected by the ingestion of alcohol. So, practically speaking, what is a social drinker to do? Well, you could just plan ahead for that cab ride home. You could agree among friends who will be the designated driver and ensure that you're ready to leave the party when the DD is. OR, you could become an "informed" social drinker. Becoming an informed social drinker requires you to know, with certainty, what your BAC is at all times during the act of drinking. You should also be able to predetermine what your BAC would be if you had that next drink and how long it will take you to eliminate it. Of course, you should also have a reliable tool to perform all those calculations for you because your brain won't be up to the task when your actually doing the drinking. Does such a tool exist? Yes it does. It's called BAQ Tracker Mobile (www.baqtracker.com) and is currently available for the BlackBerry suite of smartphones. An iPhone version is scheduled to be released in the New Year. The idea behind the App is very simple...when a person goes out socializing with friends they keep track of what they’re drinking and the App calculates their blood alcohol concentration (BAC) in real time. Voila! No more guessing. Social drinkers can check out what will happen to their BAC before they order that next drink and they can learn how long it will take them to get rid of the drink they just had! AND, in so doing, they make our communities safer places to live. BAQ Tracker Mobile was developed in cooperation with renowned and well respected Canadian forensic toxicologist (and Borkenstein Program lecturer) – Jim Wigmore. It is not a toy. It contains the same level of science that our enforcement and legal communities use on a day-to-day basis. Nobody thinks drinking and driving is about them. But, by design, social drinkers are very much part of the problem. Ladybug Teknologies is trying to change that. Not by telling everyone to stop drinking, but by helping social drinkers become more informed. The average BAC of DUI offenders is 0.16% BAC – twice the legal limit. Please help us spread the word. Informed consumption and personal accountability are the cornerstones of safer communities.